Savvy Deets Bridal: A Savvy Guest Book Alternative: Calendars! A Savvy Guest Book Alternative: Calendars! This idea is so inspiring! 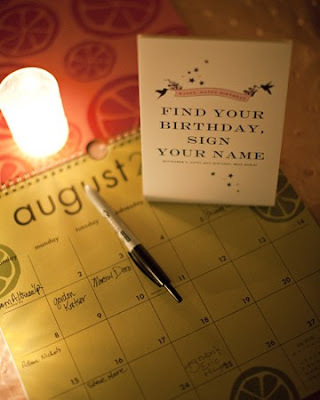 What a great way to collect guests' birthdays for any event, especially at a wedding! Since my own wedding I have struggled to keep up with correspondences, not remembering birthdays, anniversaries, etc. Not to mention Christmas cards-an error I am forcing myself to correct this year. This idea is one I really wish I had conjured up. I still have time to reach out to everyone to get their birthdays & anniversaries, yet having done this at my wedding would've saved a lot of time and unreturned calls/bounced emails. Having this as a guest book alternative is a two-fold gift: 1) You have a calendar filled with everyone's birthdays, even anniversaries, of guests, where addresses are already filed away, 2) Your guests will be so pleased to receive celebratory notes every year because they signed your alternative guest book! A very savvy way to acquire "info" from your guests that you can use to their benefit for years to come! The point is to update your calendars at the turn of each year. Another savvy idea, before each month, go shopping on a quiet day, and collect unique cards for those whom have celebrations the following month, and you are set to send out your correspondences in time! Sometimes in the heat of the moment, rushing to get a card at the last moment can come off as not much thought was put into sending the well wishes. Even better, make the cards yourself, if you are so inclined to do so! What do you think of this idea? Would you have this guest book alternative for your events?